Ahmedabad, September 14, 2017: In 1853, the travel and transport ecosystem in Indian witnessed a revolutionary change, with the introduction of the first passenger locomotive between Bombay and Thane. Today, the Indian Railways is on the brink of another grounding breaking milestone. September 14, 2017 marks a new watershed for India with the commencement of work of its first high speed railway project ceremonially by the Hon’ble Prime Minister of India and Hon’ble Prime Minister of Japan. The 508-km National High Speed Rail Project between Mumbai and Ahmedabad, (MAHSR), aims to reduce the journey time between Ahmedabad and Mumbai to 2.07 hours approximately (for stoppages at limited stations) from the eight hours it takes at present. This is possible due the operating speed of 320 kmph at which this train will run. The top speed for the train is 350 kmph, the highest in the world currently for a railway system on wheels. The Japanese Shinkansen technology is being used for the MAHSR. The MAHSR project marks the arrival of the fastest means of ground transportation for the citizens of India with a never before long-term impact and transformative effect. The project makes India a part of the elite club of countries with state-of-the-art high speed railway systems. Indians as a whole will now have access, for the first time in history, to not only an opportunity for leveraging critical change in not only land transport, but also to world-class and epochal social rejuvenation. This project marks a sweeping re-definition of development vision, engineering and technological infusion, and economic-social catalysis. The MAHSR project is a major step forward in creating a vibrant and dynamic eco-system for new-age and New India initiatives, which lie at the heart of a visionary, responsive, inclusive, and sensitive growth-oriented governance. The MAHSR design is based on proven Japanese Shinkansen high speed railway system with a record of zero casualties in its 50 years of operation and high reliability. Key features of the system include a dedicated railway track with no railroad crossings, Automatic Train Control systems ensuring minimum human interface, and accurate braking and cutting-edge Disaster Prevention System against strong winds, heavy rains, high rail temperatures, earthquakes etc. The MAHSR shall be operated at a speed of 320 kmph with the top speed possible of up to 350 kmph. This will dramatically reduce the travel time to 2.07 hrs (with limited stops) and 2.58 hrs (while stopping at all stations) between Mumbai and Ahmedabad. With the MAHSR, the total time taken to travel, from home to destination between Mumbai and Ahmedabad, would be advantageous and lower than the time taken to travel by any other means between the two cities. The train crosses 70 highway crossings, 30 railway crossings, 173 major bridges, in addition to other small roads and landmarks. The train will also cross 20 major rivers in its journey. Initially each train will have 10 cars with a capacity with 75 seats and with adequate frequency for passenger convenience. Progressively, the 10 car trains would be replaced by 16 car trains with 1,250 seats and the number of trains per day would also be progressively increased to ensure convenience to passengers. The rail cars will have a double-skin aluminum alloy body for reduced weight and better ride comfort. The nose of the train has a specially designed pantograph to reduce noise and tunnel boom. The coaches would be designed to have the highest comfort with state of the art suspension systems and dampers. The coaches will also have rotating chairs so that they face in the direction of train movement, thereby allowing families and friends to sit facing each other. There would be separate seats and toilets in train for passengers using motorized wheelchairs. All toilets would be vacuum-based and there are plans to have some separate toilets for women. The state-of the-art technology will be checked for maintenance purposes every night after commercial operations are over. The detailed data for maintenance will be collected to effortlessly plan the repair schedule. The MAHSR will be more efficient in its use of energy than competing modes of transport a­­­nd also more eco- friendly. It will have one of the lowest power to seat ratio in the range of 13.13 KW per seat. This energy efficiency is enabled due to reduced weight, aerodynamic profile, smoother curves, efficient propulsion system, reduced journey time for auxiliaries, and a homogeneous speed profile. All the energy needs of the project shall be primarily met through electricity generated within the country and not through imported fuel. 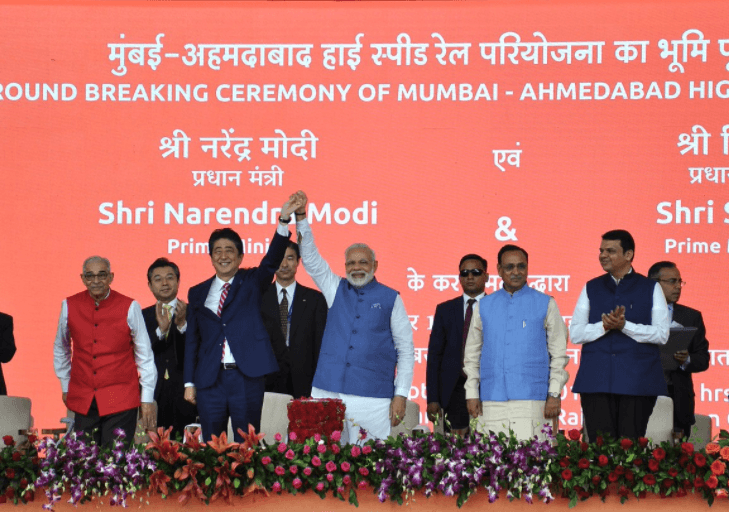 The Mumbai-Ahmedabad High Speed Rail Project was sanctioned for implementation with technical and financial assistance of the Japanese government in December 2015. The cost of this mega project is estimated at Rs. 1,10,000 crore. A Soft loan from the Japanese government covers 81 per cent of the total project cost. The loan has been offered at an interest rate of 0.1 percent with repayment over 50 years and a moratorium for the first 15 years. This is, in fact, the best soft term-loan under the ODA, (Overseas Development Assistance) program. The MAHSR incorporates key ‘Make in India’ and ‘Transfer of Technology’ (TOT) objectives as per the agreement between the two sovereign Governments of India and Japan. Four sub-groups with representatives from Indian industry, Japanese industry, Department of Industrial Policy & Promotion (DIPP), NHSRCL and Japanese External Trade Organization (JETRO) have been set up to identify potential items and sub­systems for Make in India. Sector specific meetings of established Japanese manufacturers with prospective Indian manufacturers have already been held and more are planned to facilitate "match making". Japanese firms are welcome to set up partnerships and manufacturing bases in India. The government advises Indian firms to avail this opportunity for technical upgradation. The advantage to Japanese companies would be the clear access to the big and growing Indian Railways and Metro Railway market. The lower cost of production in India will make Japanese products cost competitive for exports to other countries. Thus, it is win-win proposition for both countries. The government welcomes Japanese firms to "Make in India" and help make the HSR project a success for both India and Japan. Worldwide, the high-speed rail is seen as a catalyst for economic growth. The MAHSR project is going to be a major catalyst for development and connectivity. The fast, comfortable and convenient connectivity of the two, large, commercial centres of the two states would help facilitate businesses, industries and economy. The construction of 12 well connected stations in 12 cities would be a boost to catalyze the development of related businesses in station vicinity and a boon for transit oriented development goals. The construction of this large state-of-the-art infrastructure and consequent operation and maintenance will help in growth of railway related industries in general and consequent employment generation. A world class High Speed Railway Technology Training Centre will come up in Vadodara with world-class simulators and teaching techniques, practical laboratories, and hostels. Human Resources would be developed for the operation, maintenance and management of the High Speed Rail corridor through various training programs. 300 officials would be trained in Japan, who will later help in the training of 4,000 officials. These officials would go on to become the backbone of India's future high speed railway plans. The project is set to energize the building of the New India Mission of the government.